Fall has arrived and to celebrate I made pumpkin pie. This will definitely be the first of many, especially with Thanksgiving around the corner. 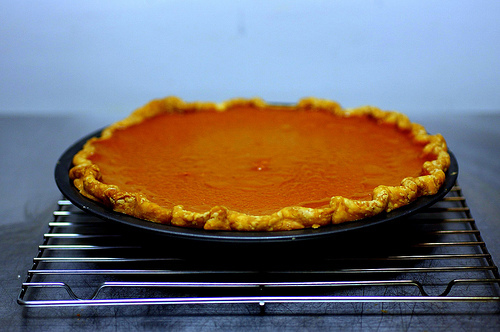 Like so many other pie varieties there are dozens of pumpkin pie recipes to choose from. I wanted something quick and easy so I modified the recipe on the label of my can of Polar Pumpkin. 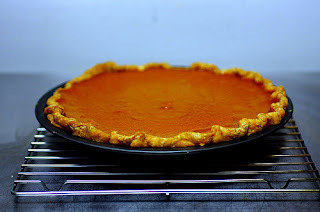 I thought using sweetened condensed milk instead of heavy cream, half-n-half, or milk might make my pie too sweet but in fact it came out just right with an interesting balance of flavors. Preheat oven to 425º degrees. Whisk together sweetened condensed milk, eggs, vanilla extract, spices and salt in a large bowl. Add pumpkin to the mixture. Continue to whisk until smooth. Pour filling into warm pre-baked pie shell. Return pie plate with baking sheet to oven and bake pie for 15 minutes. Preheat oven to 400º degrees. Mix flour, sugar, and salt in large bowl; cut in 2 tablespoons of the butter until it resembles coarse cornmeal. Add remaining butter; cut in until biggest pieces look like large peas. Dribble in water, stir, then dribble in more, until dough just holds together. Toss with hands, letting it fall through fingers, until it is ropey with some dry patches. If too dry, add another tablespoon water. Keep tossing until you can roll dough into a ball. Flatten onto a 4-inch thick disk; refrigerate. After a minimum of 30 minutes, remove; let soften so it's malleable but still cold. Smooth cracks at edges. On a lightly floured surface, roll into a 12-inch circle and 1/8-inch thick. Dust excess flour from both sides with a dry pastry brush. Roll dough loosely around rolling pin and unroll into pie plate, leaving at least 1-inch overhang all around pie plate. Refrigerate 15 minutes. Trim overhang to 1/2-inch beyond lip of the pie plate. Fold overhang under itself; edge should be flush with edge of pie plate. Using thumb and forefinger, flute edge of dough. Refrigerate until firm, about 15 minutes. Remove pan from refrigerator, line crust with foil and fill with pie weights. Baked on rimmed baking sheet 15 minutes. Remove foil and weights, rotate plate. Bake 5 to 10 minutes until crust is golden brown and crisp. Remove and let cool while preparing filling.